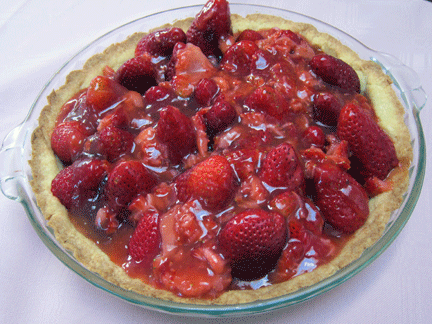 The local markets are full of strawberries right now, perfect for my friend Linda’s “Simply Strawberry Pie”. My favorites berries are grown in Carlsbad, CA, about 20 miles north of our house. I have made this pie since grad school, but have recently switched to a shortbread crust. My Scottish ancestors would scold me for substituting all-purpose flour for the traditional rice flour I use in my cookies, but I think the all-purpose flour makes a sturdier crust for the filling. Be sure to let the crust completely cool before piling on the berries, and, yes, you will need three baskets of strawberries for this fresh-tasting spring pie. 1. Combine the butter and sugar, using two forks. Add the egg yolk and mix well. Add the flour and use your fingers to make a crumbly dough. 2. Pat into a 9-inch pie plate and chill in fridge for 1-2 hours. 3. Preheat oven to 40 degrees. Remove from fridge, prick holes in crust with a fork and line with parchment paper and pie weights. Bake for 10 minutes, remove pie weights and parchment. Bake for an additional 5 minutes until golden brown. Cool completely before adding strawberry filling!